Enlisted at 20 years old and mustered as Private, Company G, 108th New York Infantry on 9 August 1862. He died of disease 23 December 1862 at Falmouth, VA. Basic information from Washburn1. Service data from State of New York2. 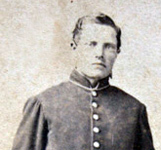 His photograph from a CDV from the New York State Military Museum.